I would like to use UAVCAN to communicate with an ESC (a VESC actually). 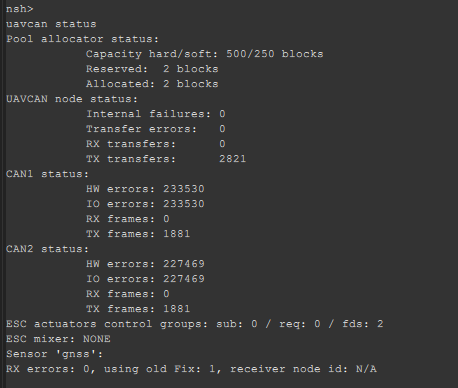 However I can't start the configuration of UAVCAN ESC in QGroundControl. In the Power tab when I click on "Start Assignement" either I get the message "vehicle not responding to UAVCAN configure command" or "UAVCAN configure command failed". I tried with a pixhawk 2.1 and a pixhawk 4. What can I do to fix it and to setup UAVCAN ? I'm going to ping @PavelKirienko hoping that he can help you. AFAIK VESC doesn't support automated ESC index assignment. First of all many thanks for the reply. Do you know if there is a way to do it manually ? I tried the 3 options I have on QGC : "Sensors manual config", "Sensors automatic config" "Sensors and actuators automatic config" and none of them work. I work on a project (www.skypull.com) where we really need feedback from the controller to the pixhawk, and UAVCAN seems really promising. I am trying a similar thing. The functions inside esc_main.cpp files are not getting executed when I initiate "uavcan start" command through Mavlink console. Are you facing a similar issue? Yes, I too changed the uavcan in QGC into three options like you mentioned but nothing helped. Using Mavlink consol seems to work, the command "uavcan start" works. But then I don't know what to do, how to establish a connection between the pixhawk and the vesc using Mavlink console ? How do you know that the functions inside esc_main.cpp files are not getting executed ? Yes, when I enter "uavcan start" I was not seeing outputs at first. But I then tried "uavcan stop" and "start" again, I could see values being sent from my pixhawk. I am not familiarized with vesc actually. But in your case , did you create a new DSDL file to send value or so? How are trying to connect to vesc from pixhawk ? The VESC supports UAVCAN, the pixhawk supports it as well, so I thought it was just a matter of simple settings like baud rate or CAN ID... According to this page: https://dev.px4.io/en/uavcan/node_enumeration.html and this page http://ardupilot.org/copter/docs/common-uavcan-escs.html it seemed straightforward. So no, I did not create a new DSDL file. Did you do it ? I'm new to CAN connections, I will try to understand UAVCAN more in detail because it is more complex than what I thought, I am currently reading https://uavcan.org/Specification . But then I don't know what to do, everything I tried did not worked. I set different UAVCAN index for the VESC using VESC tool. I assumed it is its UAVCAN ID but maybe it's not ? In mavlink I get "ERROR [uavcan] invalid node id" when trying to use any command with VESC_ID. I am not sure how VESC communicate. I created a new CAN message(DSDL file) apart from the existing ones to send my data(say, integer). The broadcast(msg) function is doing the transmission of data from Pixhawk board I guess. I placed few print statements in my functions and I could see they are running successfully but since I am not mapping data type ID correctly, I am facing issues during transmission. I found a research paper of sending and receiving data through UAVCAN from an author Pedro Bernado Andrade. That's the only paper I can find.! Please take a look into it.